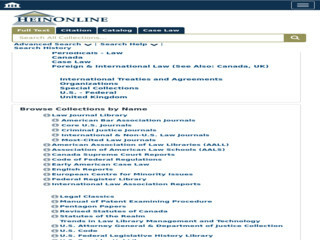 HeinOnline is online research database with more than 100 million pages of legal history available in an online fully-searchable, image-based format. HeinOnline bridges the gap in legal history by providing comprehensive coverage from inception of more than 2000 law and law related periodicals and 5000+ Classic Ebooks. HeinOnline provides exact page images of the documents in PDF format just as they appear in the original print. This means that all charts, graphs, tables, pictures, hand written notes, photographs, and footnotes. HeinOnline is counted as best database for access of academic articles form research purpose. HeinOnline is also ip based and accessible within IP Ranges of the National Law University Delhi.